Details: The Cognos BI portal is addressed to both business and technical users. Cognos BI Info provides technical cognos tutorials and FAQs as well as business guides for end-users. 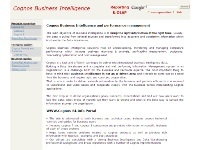 It includes cognos 7 and cognos 8 comparison and provides information on specific features of each of these applications. It is a good place to get help in resolving problems related to cognos products as well as find overall information on reporting, OLAP by studying tutorials, real-life examples and best practices.